The BOE voted to name a new Richard Montgomery cluster elementary school after Bayard Rustin, making it the first MCPS school with an openly LGBTQ namesake. Rustin helped organize the 1963 March on Washington. Photo courtesy MCPS. The MCPS Board of Education voted 6-2 April 12 to name a new Richard Montgomery cluster elementary school after openly gay civil rights activist Bayard Rustin. The school will open this fall and be the first in MCPS to have an openly LGBTQ namesake. Rustin worked alongside Martin Luther King Jr. to organize the March on Washington and posthumously earned the Presidential Medal of Freedom in 2013. He faced criticism at work due to both his sexual orientation and radical ideology for the time. At the height of the civil rights movement in the 1960s, he served jail time for his civil disobedience and charges related to his homosexuality. The board created a 12-person naming committee comprised of parents, school principal Rachel DuBois and other community members to discuss and narrow down names from which the BOE could make a final decision. Committee members created an online survey to help gauge community preferences and used the MCPS school naming criteria. 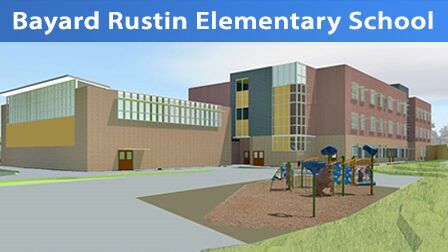 Ultimately, the committee ranked Rustin fourth on the final list of six names it submitted to the BOE on March 15. The motion to use Rustin’s name then passed with only two board members dissenting. “I don’t want folks in the LGBTQ community to think that voting against [Rustin means] that we are against them, but one of the reasons I ran for the Board of Education was that I felt we should get input from the community” dissenting board member Jeanette Dixon said at the meeting prior to the final vote. “I feel strongly about listening to the community and doing what the community asked us to do,” Dixon added in an April 12 MyMCMedia post. The other proposed names on the list included naming the school after the local Dogwood tree and four African-American historical figures. Rustin parent Mark Eckstein Bernardo was on the naming committee and an advocate for the use of Rustin’s name. Pushback to the name has come not only from implicit biases and discomfort, but also in the form of outright opposition, Bernardo said. 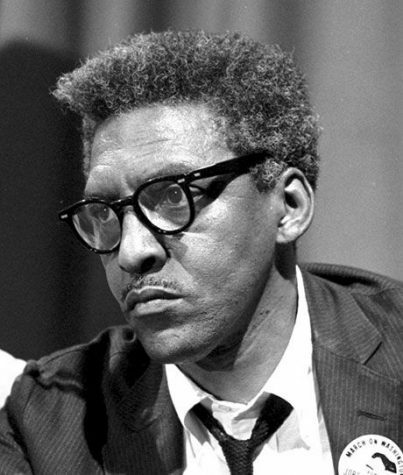 Bayard Rustin. Photo courtesy MCPS. The idea of making the county more inclusive stemmed partially from the updated MCPS Nondiscrimination, Equity and Cultural Proficiency policy revised in 2017, Bernardo said. People underestimate the relevancy of LGBTQ issues at an elementary-school level, but numerous counselors report that there are at least a handful of LGBTQ-identifying students—specifically transgender students—at elementary schools, he added. Many students are excited about the diversification of school naming in the county. Various local groups have expressed support for the decision to name after Rustin, including the Maryland chapter of the LGBTQ-education group GLSEN and MoCo Pride Center. Public figures from other states voiced their support, including Representative John Lewis (D-GA) and Rustin’s former partner Walter Naegle according to an April 11 Bethesda Magazine article. For Bernardo, the naming isn’t asking a lot but still demonstrates powerful solidarity with LGBTQ youth.